Historical yet modern. The largest city in Central America; vibrant, full of color, with a pleasant climate and people always ready to give you a smile. Formerly called "little silver cup" for its design and architecture. You will discover elegant theaters, impressive churches, beautiful colonial houses and picturesque streets, all linked to a wide and tasty gastronomy. 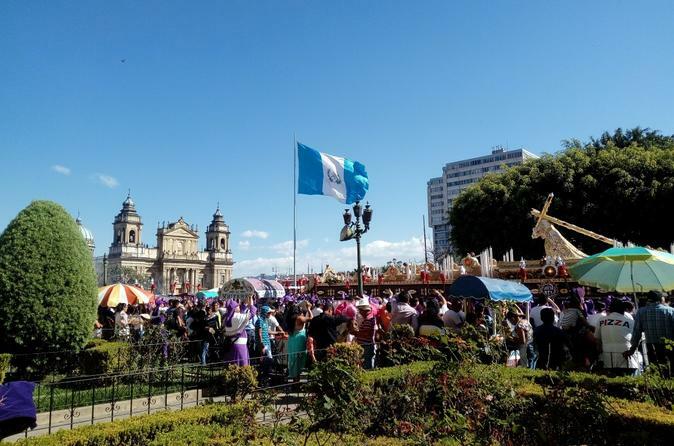 This tour is one of our specialties, you will visit the old and modern parts of Guatemala City. We begin touring the best of the historic center, walking along the famous Sixth Avenue towards the central park. We will visit the national palace, the cathedral and the colorful central market. A historical and cultural tour through the main attractions of the city. The relief map, a masterpiece built in 1905 to know the geographical diversity of the country. Then by vehicle, we will visit the modern areas to observe the urban growth of this great metropolis.